As not every aircraft lands as whisper quiet as this one, SoundPLAN noise modeling is needed! In contrast to the standard aircraft noise models, SoundPLAN makes it possible to depict a comprehensive noise picture of the flight operations around airports. Aircraft taxi, start, and land, but there are also the ground operations of engine run-up, auxiliary power units, carts of rattling baggage containers, air conditioning and traffic sources. 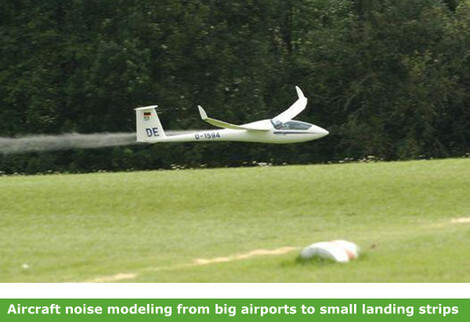 SoundPLAN is capable of calculating noise levels for flying aircraft in accordance to various established models and can add the noise of traffic and industrial sources to give a complete account of the noise situation. Use the SoundPLAN aircraft model to create, evaluate and compare multiple scenarios with different approach and departure routings, different aircraft, and different scheduling. SoundPLAN has 3 calculation modes, the assessment of single receivers, the direct generation of specific noise contours and the calculation of noise maps. For all the calculations, post processing tools are available in the Documentation and in the Graphics. Noise maps resulting in Leq calculations can also be overlaid with other noise maps that cover other aspects of the airport (run-ups, taxiing operations, air conditioning, etc.) to form a comprehensive picture. Airports are the central location for flight. The world coordinates of the airport reference point defines the entire geometry relative to this location. There can be many runways in an airport, all referenced to the airport reference point. Depending on the weather, each runway is used in different directions, each identified by rounding the direction to the closest 10 degrees. Thus, on runway 31, an aircraft would land towards the northwest, but when the wind changes, it would land on runway 13, towards the south east. All flight paths tie into a runway. They are defined only with the element of a straight line with a heading of x-degrees and a turn to left/right with a given radius. 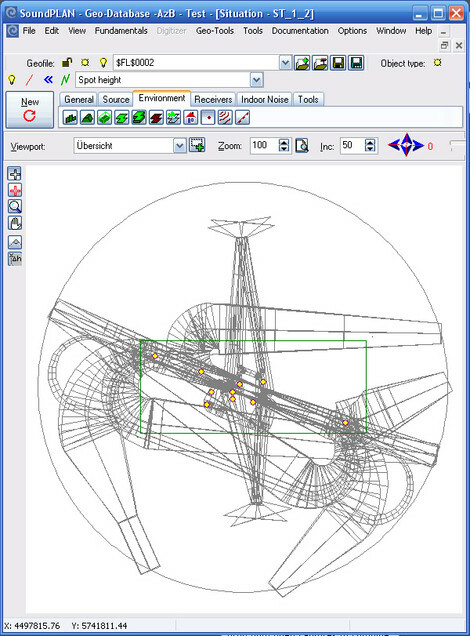 As aircraft do not run on rails, slight deviations must be accounted for by defining a corridor width. The climb and descent profile, as well as the acoustical properties, are defined in the SoundPLAN aircraft class library. The library is delivered as a system library, but can be amended any time to customize it for a particular airport or operations. To see more information about the aircraft noise, click here: aircraft noise and radar tracks. No reviews were found for SoundPLAN - Aircraft Noise Module. Be the first to review!